Nature's Plus Source of Life Animal Parade Inner Ear Support chewables deliver K12 probiotics to your child's inner ear and throat. 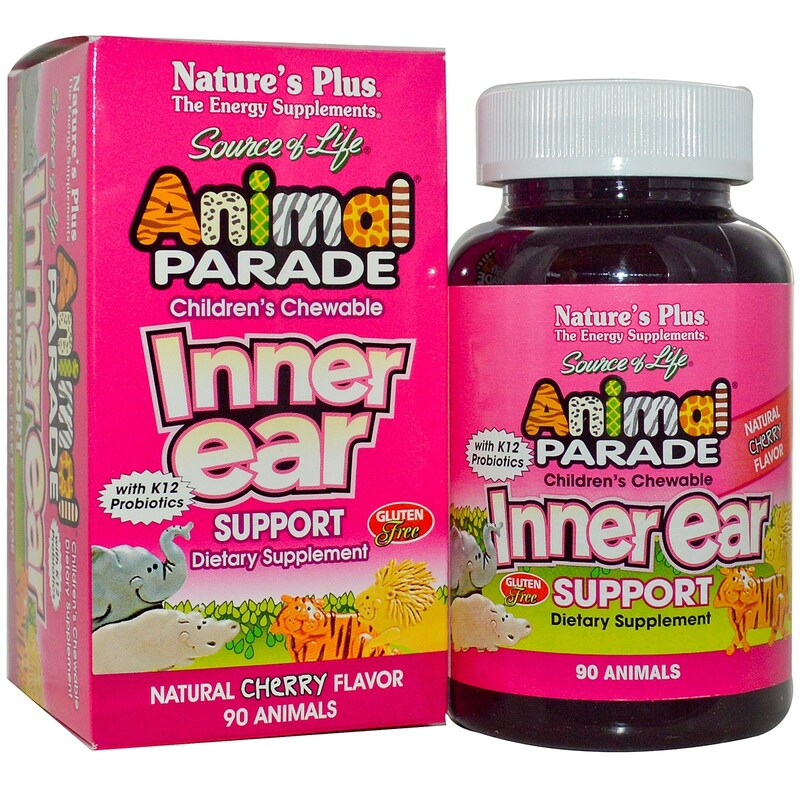 With the Animal Parade Children's Chewable Inner Ear Support supplement, the help of billions of live probiotic cells are enlisted to maintain a balanced environment in the child's inner ear, mouth and throat. Each chewable also includes the cooling, calming and soothing properties of chamomile and mullein extracts. This supplement offers your child complete probiotic support for optimal inner ear health. Each chewable has an interesting animal shape and delicious cherry flavour. Two Chewable tablets provide: L. acidophilus (2 billion viable cells) 150 mg S. salivarius K12 (1 billion viable cells‡) 10 mg Percent Daily Values (DV) are based on a 2,000 calorie diet. Daily Value not established. Other ingredients: Xylitol, di-calcium phosphate, stearic acid, natural cherry flavour, citric acid, magnesium stearate, guar gum, natural color, Inner Ear Support Herbal Blend (chamomile [matricaria recutita flower] and mullein leaf [verbascus thapsus L.]). Free from artificial colors and preservatives. Free from the common allergens yeast, wheat, and soy.